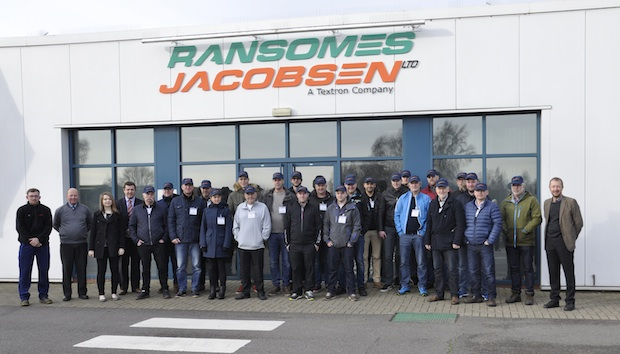 Twenty five greenkeepers from the Norwegian Greenkeepers’ Association (NGA) visited Ransomes Jacobsen’s European headquarter in Ipswich as part of their annual conference. The NGA conference takes place in January every year at various locations across Europe and this year southern England was the venue, with the week-long event held at Lingfield Park Marriott Hotel and Country Club in Surrey. Education plays a major part in the conference and the NGA invited professional educators to speak to the delegates. Part of this year’s conference involved the visit to Ipswich, where they were welcomed by Sales Director, Rupert Price. After a brief introductory company presentation, the superintendents and greenkeepers walked the RJ National, Ransomes Jacobsen’s three-hole golf course, and spoke to head greenkeeper James Gotts about its construction and his maintenance regimes. They then split into two groups for a tour of the manufacturing facility to see the range of commercial mowers being made. The tour was followed by lunch and a presentation by Product Manager Lee Kristensen on the future of mowing equipment and hybrid power sources. They then boarded a coach to nearby Trinity Park for a series of product demonstrations on some of the latest Jacobsen equipment with the opportunity to drive and mow with some of the machines.